After my post about my favorite true crime podcasts, I wanted to dive deeper into my love of true crime documentaries. My interest comes from the fact that everyone and everything is a true crime right now. Pop culture is feeding out interests and I don't think that it's going anywhere. Documentaries are easy to come by nowadays thanks to Netflix and Hulu, and everyone is getting true crime treatment. While a few of these may not be considered a 'documentary', it's still a true crime movie of the sort. These are my must-watch true crime documentaries/docuseries. This Netflix special series was a wild ride, and very hard to watch at times. It's about the unsolved murder of a Baltimore based, Catholic nun, Cathy Cesnick. You think you're getting into a regular old murder mystery but what the documentary uncovers goes much deeper than that. The sexual abuse going on at the school that Cesnick worked at comes to light, and the director does his best to get answers. This is a case that I got super into and I still think about it to this day. It's a very slow series but very interesting. While it isn't a Netflix original (except for the last few episodes), you can still binge watch it there. The series follows Michael Peterson's story of his wife allegedly falling down the stairs to her death. Did he do it? Did she just fall? What really happened to Kathleen Peterson? I personally think he did it, and please do yourself a favor and look up 'the owl theory' but either way, you need to know everything about this case. This is one of the series that isn't necessarily a docuseries or documentary; it's more of a regular series with actors and dramatized events but it's one you need to watch. It is about the story of Gypsy Rose and Dee Dee Blanchard; Dee had Munchausen by Proxy Syndrome and convinced her daughter, Gypsy (as well as others) that she was gravely ill. Gypsy was in a wheelchair that she didn't need, used a feeding tube that was unnecessary and was falsely diagnosed with leukemia, diabetes and other diseases. Eventually, one day Dee Dee turns up dead and the story rolls on from there. The story in itself is wild and I recommend the 20/20 special on it, but please get yourself a Hulu account and watch this intense, horrific tale of mother and daughter. I remember when the story of Amanda Knox was happening; it was something truly insane and I've remained fascinated with the story until now. This was released on Netflix in 2016 and was probably one of the first true crime documentaries I watched. Knox told the story of her innocence and the murder of her Italian roommate, Meredith Kercher and it was interesting to say the least. If you've ever had an off opinion of Amanda Knox, I highly recommend watching it. If you haven't heard about this yet, where have you been? It has been everywhere for the past few months and is a short watch. It's an incredibly strange, gut-wrenching story and you will be shocked at how stupid and naive some people are. Spend your night with Netflix and this very stupid family, you won't regret it. 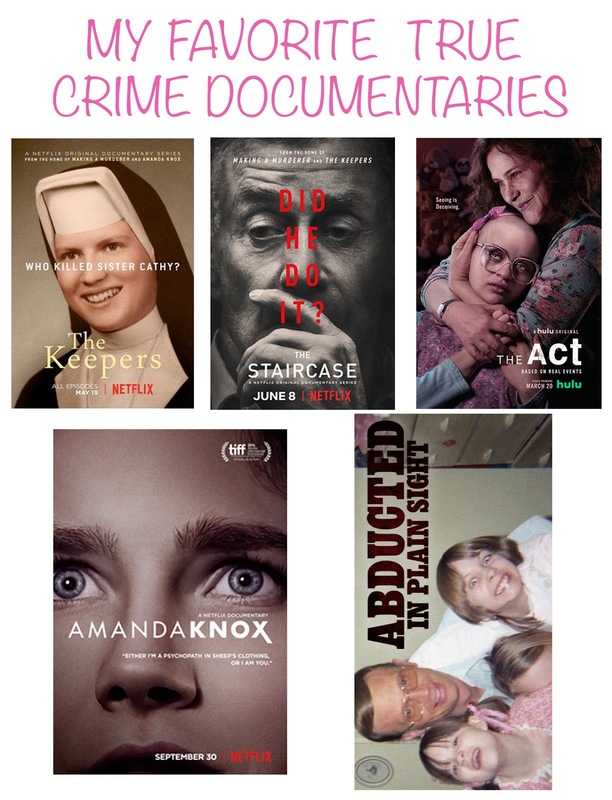 What are your favorite true crime docuseries?